The early versions of the MGB GT have long held an appeal for Jaime Steve. Even 25 years ago, while studying for the NewYork bar examination, he had above his desk a photograph of a red MGB GT for inspiration. As the years passed Steve discovered that early MGB GT models were becoming scarce. However, he continued searching and in the spring of 2012, while electronically browsing on eBay he found a red 1967 MGB GT offered for sale in McKeesport, Pa., near Pittsburgh. After Steve and the seller, Dan Meyers, corresponded to get any and all questions about the car answered detailed photographs were sent which convinced Steve that this was the car for him. Records indicate that this 1967 MGB GT was built in 1966 between May 25 and June 3. Steve flew to Pittsburgh where Meyers met him and they went to see the MGB GT. Steve purchased the car May 13, 2012 and he set off on an uneventful four-hour drive home to Alexandria, Va. The optimistic speedometer can register speeds up to 120 miles per hour, a top speed that Steve considers unlikely. A pair of S.U. carburetors feed fuel from the 14-gallon gasoline tank to the engine. The owner reports fuel economy approaching 30 miles per gallon. The four-speed manual transmission is not synchronized in first gear. With the exception of an off white headliner and red piping on the leather seats, the interior is all black. Direct rack and pinion steering makes for nimble handling. Turning the 16-inch steering wheel from lock to lock is accomplished in only 2.9 turns. There are three spokes on the banjo-style steering wheel which has an energy-absorbing feature on the steering column. • Wire wheels painted silver. Steve points out that the radio is original to the car. Also on the sports car are two wipers to clear the windshield, turn signal indicator lights as well as a heater. According to Steve the original red paint has been replaced but with more red paint. Occupants of the MGB GT are kept comfortable in hot weather even with no air conditioning. The side windows on either end of the back seat are hinged at the front, just behind the front doors, and they can be pushed open at the rear to provide flow-through ventilation. Although the amount of space for occupants of the front bucket seats is abundant the same cannot be said for the rear seat passengers. The maximum amount of leg room for rear seat passengers is listed as six inches. When space is required to carry luggage or cargo the MGB GT is superior to the standard MGB roadster which has a small trunk. The back of the rear seat in the MGB GT model can be lowered and cinched down to provide a nearly flat floor. The chrome grille and chrome front bumper both sparkle so readily that Steve suspects the originals have been replaced. That suits him fine because later MGB GT models after 1974, in response to safety regulations in the United States, came equipped with enormous rubber bumpers. 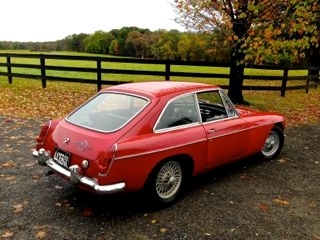 Because the majority of MGB GT customers were in the U. S. the manufacturer honored the American regulations. No longer does Steve need a picture of a red MGB GT for inspiration. He has the real thing in his garage.